This month’s bright idea is geared towards providing a simple twist on a common lighting control method. One simple solution is aimed at using bright light to trigger easy savings for you with no sacrifice of comfort. I’m talking about indoor photo cells and here’s how they can work for you or your building. 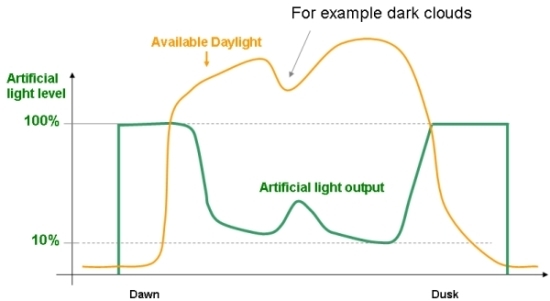 Daylight harvesting is a technique that is gaining popularity in the commercial industry and now has a place for residential applications too. The concept is simple, monitor the natural light present in a room and adjust the artificial sources to maintain an even level. Better said, as the sun comes up, the lights go off, all without the user having to control these settings. Daylight harvesting or photo control uses two components. The first is a sensor located in the controlled space that monitors the amount of incoming light. This is coupled with a controller or dimming ballast that will then alter or dim the room’s light source in conjunction with the ambient light levels. So, the user only needs to provide a base set point (brightness level) and then the system does the rest. A harvesting system can be a complex network of controllers and sensors or a simple standalone unit that completely turns the light off once optimal levels are reached. As night approaches, the artificial light source is energized keeping balance in the room at all times. Dimming your lights as needed can not only reduce electricity consumed but also increases the life of your fixture’s lamps, saving future time and money in maintenance fees. Call Jenco today and find out more so that you can harness the savings through this bright idea!